You can certainly do better than this machine, but it might tempt you with its gorgeous design and low price. When Acer released the Acer Aspire R 13, it once again threw its hat into the mid-range 2-in-1 laptop market. Piggybacking on the design innovation of the Aspire R 7, the R 13 was meant to be an avant garde, Ezel-hinged hybrid laptop. Unfortunately, we weren't wowed. The problem is simple. Acer is competing in a market saturated with heavy hitters, like the Lenovo Yoga Pro 3 ($1,099, £1,099, AUS$1,254) and Asus Transformer Book T300 Chi ($899, £601, AU$1,156), as well as the best of the bunch, the Microsoft Surface Pro 3 (starting at $799, £639, AU$979). Acer wants to win by evolving above-the-hood rather than beneath it. I was excited to briefly test the latest addition to the Aspire family, the Acer Aspire R 11 ($249, £165, or AU$320), a budget, 11-inch transformer with a pretty design. But after a quick inspection, it was clear to me that history had repeated itself - Acer had opted for beauty instead of brains. Like most of Acer's new budget laptops, the Aspire R 11 features a gorgeous matte material (in light blue) that covers the top and bottom of the notebook's plastic chassis. 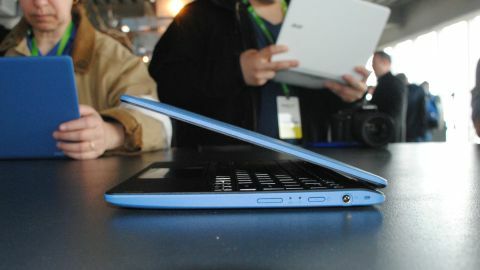 Acer touts the matting material as scratch-proof, and on most other models I noticed no blemishes at all. However, the Aspire R 11 that I previewed had a huge gash across the top of the shell. Perhaps this was a prototype error. The traditional keyboard feels great beneath your palms. Its aluminum casing appears to be smudge-proof. Unfortunately, the directional and top-line keys are so small you'll absolutely mis-strike whenever you're playing games or entering data. The Aspire 11 is built with an 11.6-inch, standard HD (1,366 x 768) display that suffers from severe glare. Photographing the front of the unit was nearly impossible, because any speck of light from any direction would find its way into the display screen. The selling point for this unit is its 360-degree hinge that enables the device to easily switch between four viewing modes: notebook, pad, display and tent. I found the hinge to be quite stiff, which required me to push and pull harder than I'd like to navigate between modes. Unfortunately for Acer, most competing devices feature much slimmer and more enjoyable displays. At 3.48 pounds (1.58kg), why would you ever want to use this device in tablet mode? Additionally, with a measly standard HD screen, why would you be excited to use this device in display mode? To compare, the Surface Pro 3 features a 2,160 x 1,440 multi-touch display that comes in a manageable 1.76 pound frame prior to adding the 0.65 pound keyboard. The Yoga 3 Pro packs a QHD+ 3,200 x 1,800 pixel display into a 2.62 pound (1.18kg) frame. These machines are up to four times more expensive than the Aspire R 11, so we're not comparing apples to apples, but it's important for us to let you know what's out there. The Aspire R 11 delivers up to eight hours of battery life, I'm told, which is in line with what the aforementioned competitors sustain. However, we've actually tested the competitors' batteries. Suffice to say, manufacturers tend to overstate how long their batteries will last, so expect this device to deliver something closer to five or six hours, rather than eight hours. Under the hood, you're working with an Intel Pentium processor and Intel HD graphics. These won't deliver workstation quality performance, but in the short time I previewed the device, I found navigation to be smooth. Switching between web-based apps, local documents and the web was a cinch. The Aspire R 11 can be configured with up to 8GB of DDR3L system memory and up to a 1TB hard drive. It features a built-in SD card reader, one USB 3.0 and USB 2.0 input apiece, and full-sized HDMI and VGA ports. The Acer Aspire R 11 looks good and it doesn't cost much. That's pretty much all I can say about it without venturing into the negative. For a device that is much too heavy, slightly inflexible, and prone to scratches, I just can't imagine it playing well in a market with such heavy competition. If you've got a few extra dollars to spend or can stand to save, you'd be better off buying something else.